For more information on rebates best practices, check out this webinar on effectively utilizing incentive management to drive profitability. 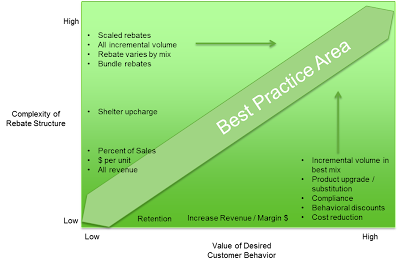 In B2B pricing, rebates are a pricing best practice. Because if you are not using rebates, you are probably giving customers larger discounts than they deserve.Rebate best practices ensure that rebates deliver the desired price, volume, and mix and that the complexities of rebate administration do not outweigh the commercial benefits. This article provides a comprehensive overview of common rebate types and use cases, tips on putting rebates to good use and suggestions for avoiding the common commercial and administrative challenges rebates can pose. When quoting prices, many sellers in B2B consider the sales volume associated with the opportunity, deal, quote or contract. For example, if a customer says they plan to buy 100 tons of LDPE (low density polyethylene), the seller will quote a lower price per pound than if the opportunity is for only 22 tons. Or, similarly, 100 parts vs 5,000 parts. This practice, common across a number of industries, is called volume based pricing or volume based discount guidelines. The commercial rationale for the seller is that larger volumes create production, sales, and logistics efficiencies which can be passed on to the customer as larger discounts. But what happens when the customer who promised to buy 100 tons only buys 22 tons? Or when a price quote for 5,000 parts generates an order than turns out to be only 800 parts? In these situations of ‘overpromised volume’, the seller probably cannot retroactively change the customer’s price. And, because the realized price does not comply with the volume sold, the customer has, in effect, extracted a noncompliant price. For Six Sigma practitioners this is known as a defect. And, the defect has cost the seller money. Rebates are employed to limit the gap between promised and actual behaviour. Rebates are used to price on ‘actual’ rather than ‘promised’ purchases. Instead of granting a discount up front and accepting the responsibility to audit sales to the customer, or worse, not auditing, the seller grants a discount only for actual volume, thereby passing the risk of non-compliance to the buyer. In addition to pricing on actual rather than promised volumes, rebates can be refined to drive specific customer behaviour such as growth, retention, product mix improvement, or purchases of bundled offers. Like other forms of discounts employed to modify behaviour, rebates allow sellers to communicate to customers how the customer receives the lowest price. The burden of realizing the lowest price, then, falls to the customer with the rebate granted only for achieving the specified outcome. Rebates can be categorized by business objective and customer type. Rebates are employed to manage incentive programs to achieve business objectives and to improve the effectiveness of selling through distribution. Following is a brief discussion of each rebate type. Volume rebates are the simplest rebate and are designed to limit customer gaming and over-promising. Instead of quoting a price driven largely by the customer’s ‘intended’, or ‘promised’ volume, the seller responds with tiered pricing where the Invoice Price is fixed, but the actual price varies with volume and the difference is granted by rebate. In response to a customer inquiry, the seller quotes these volume/price combinations. Quantity refers to the quantity of each order, rather than the cumulative quantity. And the quoted price is not the invoice price, but the price, net of rebates. Then, at the end of the agreed time period, supplier will measure the customer’s actual purchases and issue a rebate equivalent to the calculation based on volume depicted in the table below. Growth rebates are a simple variation of volume rebates. Growth rebates, designed to revenue or volume drive growth in a particular product family, are like volume rebates with one condition: that the rebate is paid on incremental volume, rather than on all revenue or total volume.Growth is effectively a condition attached to a volume rebate. Retention rebates are rebates paid to reward continued business, or customer loyalty. Retention rebates can be rebates of any form, volume, mix, growth, but are usually end of year or “cliff” rebates, paid upon realization of a condition. Example: purchase from Company A every month in 2010 and receive the following rebate at the end of the year. Similarly, rebates can be used to smooth volume, by giving customers with “lumpy” consumption a financial incentive to smooth purchases. Mix rebates are a best practice, designed to help improve the customer and product mix of a supply relationship. A seller uses mix rebates to encourage a distributor to sell more volume of higher mix, or margin, products, or sell more to selected end-users or end-user segments. Rebates should rarely be a constant percentage, for example, 2% on all revenue. A constant percentage risks misinterpretation as a discount. Paying different rebate rates or amounts on different product families and segments allows the seller to use rebates as a strategic lever and drive improvements to product mix. Mix rebates may be used with end-users, and absolutely should be used with distributors and buying groups. Conditional Rebates is a term that can apply to any rebate type coupled with a set of conditions. Ship & Debit rebates are a special use case. They are rebates, in that they represent an off-invoice discount which camouflages the actual price, but Ship & Debit rebates are associated with a sale made through a stocking distributor. In many cases, a manufacturer may have volume, mix and growth rebates with the distributor, and have volume rebates with the end-user, and pay Ship & Debit claims on the same transactions. The net price for these sales would be calculated net of ALL rebates. In complex channel environments or when selling to large customers, a supplier may have multiple rebate programs on every transaction. The best practice is to pay rebates not on invoice price, but on pocket price. A supplier has monthly, quarterly and annual rebates with a “big box retailer” and pays a co-operative advertising discount of 2%. The supplier should pay the annual rebate on the price net of monthly and quarterly rebates, and net of the cooperative advertising, if possible. The dollar impact of the difference is significant. Another supplier has rebates for the distributor, end-user, and buying group. The buying group rebate should be paid on the end-user price, and net of freight, if possible. This is not always commercially possible, but at the very least the supplier should make this point as a begrudging concession during negotiation. Indirect Customer rebates, sometimes called end-user rebates, are rebates between a supplier and an indirect customer: that is, the seller never invoices this customer. Despite selling through the channel the seller has visibility into major end-users, the supplier’s indirect customers, and wants to reward or motivate specific end-user behaviour despite not having a credit or billing relationship with that customer. Indirect Customer rebates are an effective tool for maintaining a strategic supply relationship with an end-user, and driving mix and volume objectives, despite the absence of a billing relationship. In most cases, Indirect Customer rebates take the form of a check, as opposed to a credit memo, which would be the case when a billing relationship exists. The servicing of “national accounts” often involves rebates of this kind. Indirect Customer rebates and Ship & Debit rebates often apply to the same transaction. The other common driver of rebate use is the desire to keep the ‘real’ price from being visible in the market. Because a rebate is, by definition, an off-invoice discount, use of a rebate allows the supplier to issue an invoice at a price that isn’t the actual, or net, price paid by the customer. Price Masking rebates, sometimes called shelter upcharges, are designed to allow invoicing at a price that is artificially high. Price Masking rebates and shelter upcharges stem from a desire to avoid self-induced downward pricing pressure in competitive, and transparent markets. In these situations, a supplier agrees to a price for a given customer, but does not want to risk having that price become visible in the marketplace, believing, and rightfully so, that a price that low will cause market erosion. If other customers learn of that price, they too will want it. Instead, the supplier invoices at a nominal price and then employs rebates to bring the customer’s price down to the agreed net price. In this case, rebates are an effective method of quoting a low net price while invoicing at a higher price. The supplier recognizes that rumours of low net prices are one thing, but a low price on an invoice is the kind of evidence that can move markets. Note: Price Masking rebates and shelter upcharges have been determined to be anticompetitive and illegal in some forms. Shelter upcharges are not a best practice, but you should be informed should they come up. Similarly, when a corporate office does not want its regional offices to have visibility into true cost, the corporate office will often ask the supplier to issue all invoices at one price and then rebate the difference. National distributors frequently request this type of rebate from their suppliers, effectively masking net price form their regional branches. Avoiding any action that will create downward pricing pressure is a very good reason to employ rebates. But, if a supplier’s organization has trouble with the administration, management, or analysis of rebates, these tactical pricing options will be unavailable to them or more trouble than they are worth. Whether you are using rebates to reward incremental volume, avoid customer gamesmanship or mask your true price on an invoice, rebates are a strategic and tactical pricing tool. Every element in the price waterfall of a business should, therefore, be for a specific purpose. This is especially true of rebates. If your business use rebates, it should employ a set of rules for when rebates are applied, how they are evaluated, and detailed definition of the process for applying them. We’ll assume that if you are reading at this point you do have rebates. The question for you then is: Are rebates helping you accomplish your stated pricing goals? Now that you are familiar with each type of rebate, the question becomes where do to use each type of rebate? Rebates should be designed to drive a specific type of customer behaviour. What we find, across verticals, is that many companies have very complex rebate structures driving one, simple customer behaviour: revenue. Rebates have become more and more complex over time, because they can, with Excel as the system of record. Yet customer behaviours has not evolved as an outcome of these increasingly complex rebates. In many settings, rebates become nothing but an additional driver of both price leakage and administrative complexity. Every organization should evaluate rebate performance. Do you have a rebate strategy? Are the organization’s rebates a strategic tool, or simply a cost of doing business, grandfathered from year to year? Suppliers should review their rebate strategy, and start by setting goals. For each channel, customer or segment, what behaviour are you trying to achieve? For each desired behaviour, establish which type of rebate to employ. Suppliers can and should create a set of rebate templates: a rebate playbook to help cut down complexity while insuring the right rebate is applied to the right customer objective. Common customer objectives and rebate types are depicted in the table. After establishing a rebate playbook, and picking the right approach for each objective, suppliers should review rebate templates to ensure that rebate complexity and rebate value are aligned. The chart below depicts the Complexity of Rebate Structure, on the vertical axis, which ranges from low to high. The horizontal axis depicts the Value of Desired Customer Behaviour, which ranges from low to high. The diagonal band represents the area of best practice. In the band, complex rebate structures foster specific and valuable customer behaviors, such as gaining incremental volume in selected product families, and, thus, are considered best practice. Rebates of low complexity are considered best practice when they achieve desired customer behavior. Where possible, use rebates to accomplish your price realization objectives. But if that is not feasible, then increase your price efficiency by streamlining rebate mechanisms and processes. Sounds simple, right? Maybe not. How hard can a volume rebate be to track and manage? In semiconductors, where matrix pricing is very common, characterized by per part prices decreasing with anticipated volume over predetermined volume buckets, customer gaming and overpromising is endemic. Rebates are an effective way of dealing with this overpromising. But rebates are considered to be more trouble than they are worth in many cases. Why would that be? Rebates are a best practice precisely because they address customer gaming and overpromising. Why is this best practice not used more widely? Rebates increase the complexity of pricing processes, adding administrative costs and complexities. In effect, for most companies, there is a variable cost to rebates. Some rebates are annual, set up once a year and apply to all volume that meets rebate conditions. If rebates are set up by Management, or maintained in spreadsheets or another system, the pricing desk and sales representative may be unaware of the existence of rebates at time of quotation to a customer. If you quote a price to a customer thinking it is a net price, and do not have visibility into the price net of rebate, you are experiencing price leakage. When you match a competitive situation, and the competitor does not have a rebate but you do, you are experiencing price leakage. After an order, suppliers working to analyze customer and product profitability turn first to invoice data. After extracting invoice data from a source system such as SAP BW, the pricing analyst loads variable cost data and endeavours to compare the margin contribution of all customer and product combinations. But if invoice price is the nominal price, before rebates where rebates exist, this waterfall analysis will be wrong or incomplete, and this customer will appear more profitable than it really is. Clearly, rebates need to be incorporated into any customer and profitability analysis. But often this is easier said than done. Many companies do not have a system of record for rebate information. Rebate information is often kept in a spreadsheet by one person. Rebate accruals are managed in yet another system. If the pricing analyst does not have access to this information, profitability reporting is wrong. Note: Vendavo should become that system of record for establishing and managing rebates. Not for rebate accruals, but for rebate management. Rebate visibility can be even more complicated if the rebate is at the product bundle rather than the individual part level. How does a supplier allocate the rebate on a product bundle to individual parts when evaluating part profitability? Sometimes reporting and accrual systems accrue rebates at the customer level only, or at the customer/product family level. How does the supplier allocate the rebate to an individual line item invoice level? Over time these questions may cause many suppliers to abandon rebates altogether. The manufacturer does not have full visibility to the distributors’ data, making it virtually impossible to track actual end-user volumes or volume compliance. The administration of rebates is often such a big problem that many companies chose not to employ them. In effect, these suppliers are choosing to sacrifice price effectiveness for price efficiency. Most suppliers understand that customers game them, would like to do something about it, but view rebates as more trouble than they are worth. The pricing best practice here is to substantially automate the rebate processes, removing all friction/variable costs from the rebate process so that a supplier can use rebates as a tool to increase price effectiveness and end customer gaming/overpromising. Even if a supplier has a process for issuing and allocating rebates, that supplier may fail to use the rebate tool effectively, instead allowing rebates to outlive their utility. The problem, of course, is that rebates get rolled over from year to year without being closely inspected. Once established with a goal in mind, they quickly become expected by the customer and the sales representative. The seller is afraid to roll them back for fear of losing customer volume. Rebates should be used to drive a very specific type of desired customer behaviour. In the example above, the supplier wants the customer to buy more volume, and gives a price incentive to do so. By employing a rebate, the supplier makes sure that the customer only gets the price incentive if they actually buy the desired volume. Significantly, with the rebate mechanism in place, the burden for extracting this lowest price falls to the customer, not to the pricing desk. Because rebates require an administrative effort to establish, most rebates apply not to spot opportunities but to ongoing supply arrangements between the supplier and ongoing trading partners, monthly customers or distributors. Rebates of this kind, between regular trading partners, are often established annually during a joint planning meeting. If the seller cannot quantify the cost of a rebate program on an annual basis, or directly measure the impact of that rebate in relation to the behaviour that they seek to encourage, then this is back in the category of rebate worst practices. A rebate is a discount like any other. A $1 invested in a rebate has an impact that can be quantified, in volume, mix or retention benefit. This can and should be quantified in a way that helps to compare rebate effectiveness. But what about rebates of this form? From the perspective of waterfall construction, this $50,000, while certainly an off-invoice discount, it is not a rebate. This kind of co-marketing expense would be reflected in another, non-rebate, waterfall element. The allocation of these kind of ‘slush fund’ programs is non-trivial, and is dealt with in another document. There are different types of rebates, employed for different tactical pricing objectives. In addition, there are different kinds of buyers. Some buyers seek to lower their ‘price’, the invoice price per unit; other buyers seek to maximize their rebate checks, or the growth of their rebate payments year over year. Over time, Vendavo can help sellers to interpret their transactional data, telling the sellers which customers and segments appear to be very sensitive to changes in invoice pricing, and which appear to be more sensitive to changes in rebates. This kind of information can help you increase prices more effectively. Increasing invoice prices to customers most sensitive to changes in rebates, and decreasing rebates to customers most sensitive to changes in invoice pricing. Rebates are a pricing best practice for driving specific customer behaviour and avoiding price leakage. Define a rebate strategy, pick the appropriate rebate, and manage execution tightly, measuring to ensure that they are accomplishing the intended goal. To learn more about rebate and incentive management, click here.